A special edition of ‘Brighton & Hove Solidarity’ – the bulletin of Brighton Solidarity Federation is now available to download, to coincide with the announcement of the emergency austerity budget today. You can download a pdf here. Contents includes: Class war budget, strikes off and redundancies on at Sussex Uni, a local teacher’s view on academy schools, local council cuts and an article on the hidden side of the World Cup – workers’ exploitation and resistance. 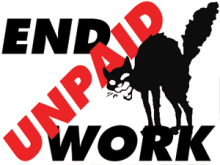 Wednesday June 16th marks the first National Day of Action against the Flexible New Deal called by the No to Welfare Abolition network. All over the country groups who are campaigning against recent welfare reforms will be taking action against the companies who are involved in running welfare-to-work. Here in Brighton we will meet at the Clocktower, outside Boots, at 11am on Wedneday 16th June. What is the Flexible New Deal? News from our comrades in Berlin, who had been dragged into the courts by the bosses of the Cinema Babylon. About 50 people gathered in the biggest hall of Berlin’s Higher Court on the morning of June 10th. They were waiting for the decision on the FAU Berlin’s appeal on whether they could call themselves a union. Only 15 minutes into the trial, the judge delivered the verdict. The injunction is overturned; the ban is repealed; the crowd goes wild. THIS Saturday (29th May), 12pm – 6pm in Brighton. Join the Facebook event. Venue to be confirmed very soon here and on Facebook. As a new government is getting ready to attack the living conditions of ordinary people, students and education workers have already had experiences with cuts – and how we can stop them. We will try to draw the lessons from the strikes, occupations and other forms of direct action taken in HE and FE over the last months. How can we build effective alliances between students and workers? How can we act in solidarity across education establishments? How can we organise from below to defend education? National conference with talks and workshops, open to students and education workers. After the failure at the polls, much attention from socialists and trade unionists has fallen upon the possibilities of working class political representation. While some talk of ‘reclaiming’ the Labour Party for the workers movement, others feel this party has had it’s day, and a replacement is needed. The Trade Unionist and Socialist Coalition (TUSC) can in many ways be seen as the springboard for the latest such attempt – coming on the heels of past attempts, such as Arthur Scargil’s Socialist Labour Party. South London Solidarity Federation Supports the Tube Cleaners. An article about the Tube cleaners Strike and action reports. Solidarity with sacked IKEA workers in Brescia, Italy. On 1st September, whilst workers were being transferred between one work agency to another, 7 workers were sacked, even though they had been assured they would be absorbed into the new agency. These general service workers had been working at IKEA for several years, had been lowly paid at €5 per hour and working up to 200 hours per month and had been working in unsafe working conditions in the underground car park with no exhaust fans. Workers even had to purchase their own safety clothing. Top London restaurant pays migrant worker £1.50 per hour. A top London restaurant paid only £1.50 an hour to a kitchen porter. Cesare Copeta, a member of the Solidarity Federation's South London local, was employed by The Food Room, owners of The French Table restaurant in Surrey and the Tom Ilic restaurant in Battersea, which is currently listed in Time Out's Top 50 London restaurants. He was employed as a kitchen porter at the Tom Ilic restaurant and had applied for the job through an advertisement in the Department of Work and Pension's Jobcentre Plus database. He worked 50 hours over a 2 week shift, but was then paid only £75. Having been paid only £1.50 per hour, he walked out of the job in disgust. Read more about Top London restaurant pays migrant worker £1.50 per hour.